Autumn is a few weeks away, and there’s nothing more comforting on a cool, autumn evening than a big bowl of steaming hot soup. It might seem like a daunting task to make your own from scratch, but if you’re starting with a rich stock base, making a variety of delicious soups is fast and easy. I make a large amount of stock, and store it in the freezer in 3 or 4 cup portions. 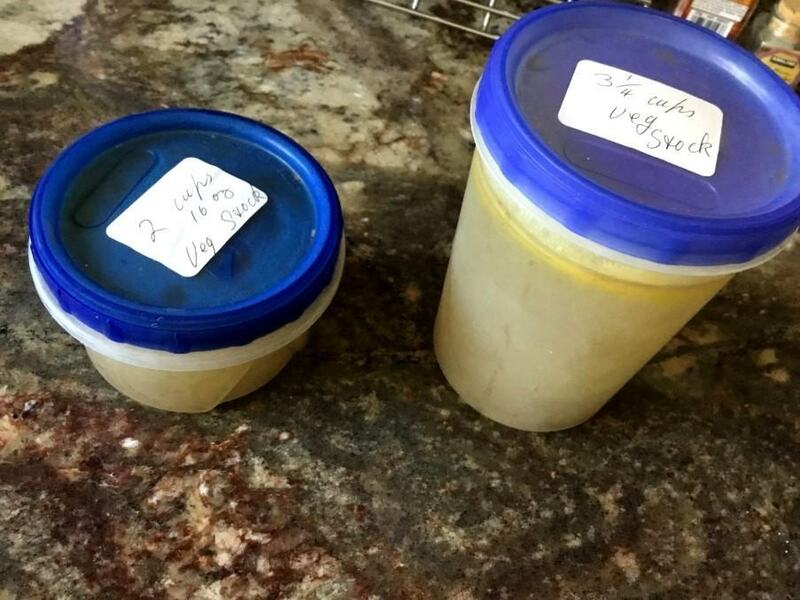 So when you’re ready to make your favorite soup, or anything that requires a stock base, you can thaw only the amount you need. It all starts with saving your veggie scraps, which once you get into the habit, takes no time at all. You’ll need ziplock freezer bags. Every time you cook with veggies, make sure you wash the skins thoroughly. Then take your peelings, end bits, etc., and throw them into the bag. Squeeze out most the air, and zip it up. Keep in the freezer, and add to it until the bag is really packed full. There are some scraps you should not use. Discard outer papery layer of onion skins, potato peeling, which have no flavor, and really tough end of veggies, or veggies that are starting to rot. Don’t use cabbage, cauliflower, or broccoli scraps, as they will add a bitter or overpowering flavor. Those can go into your container under the sink to add to your garden soil. Do add the base of veggies, such as celery, that are too tough for other dishes, and use the leaves of veggies like celery as well. Add mushroom stems, the stems of herbs such as cilantro and basil, or spinach stems, and the ends and tougher outer layers of onions. If you blanch tomatoes for other dishes and remove the center, add skins and juicy centers to your scraps as well. 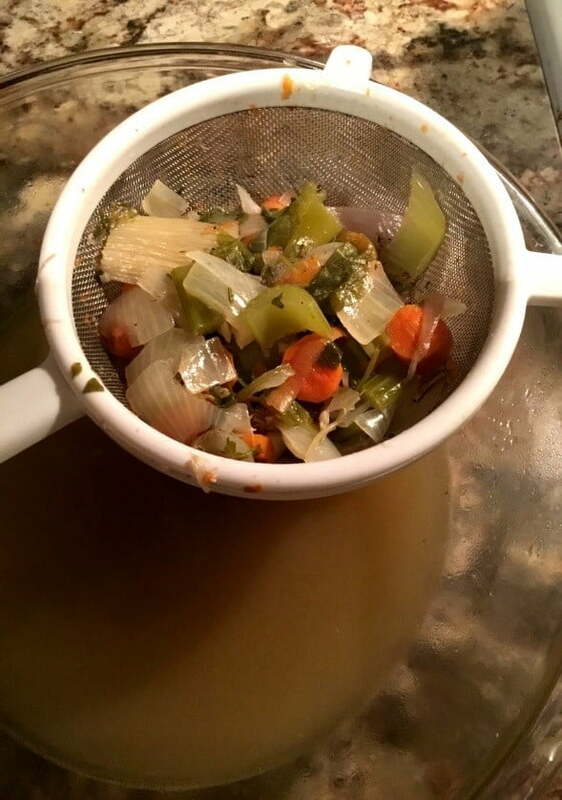 Vegetable stock is much easier to make than meat based stock. It takes less time to cook, there’s no greasy mess to clean up, and you don’t need to constantly skim the top of soup. You don’t have to cool the broth and skim off fats before it is ready to us, either. If you’re like me, and you’re into creating as little waste as possible, you’re going to love this process. No part of your vegetables go to waste. Mother Earth will love you too, because she gets the discarded veggie scraps once you’ve strained them. Instead of ending up in the garbage, they’ll end up in your garden, where they’ll be turned into fertile soil. If you don’t have a compost heap, that’s ok. Just dig them into the soil with a hand spade when you have a few minutes to spare. You’ll save money. If you buy broth, you know how much a 14oz. can costs. And it can take a lot of cans to make a good sized pot of soup. You want left-overs, right? You’ll be eating healthy. You know exactly what is going into your stock, and can use the freshest veggies, or organic veggies. I add whatever fresh herbs I might have left over from another dish as well, so they won’t go to waste either. You’ll know there is no added preservatives, flavor enhances, etc. It tastes so much better than store bought! 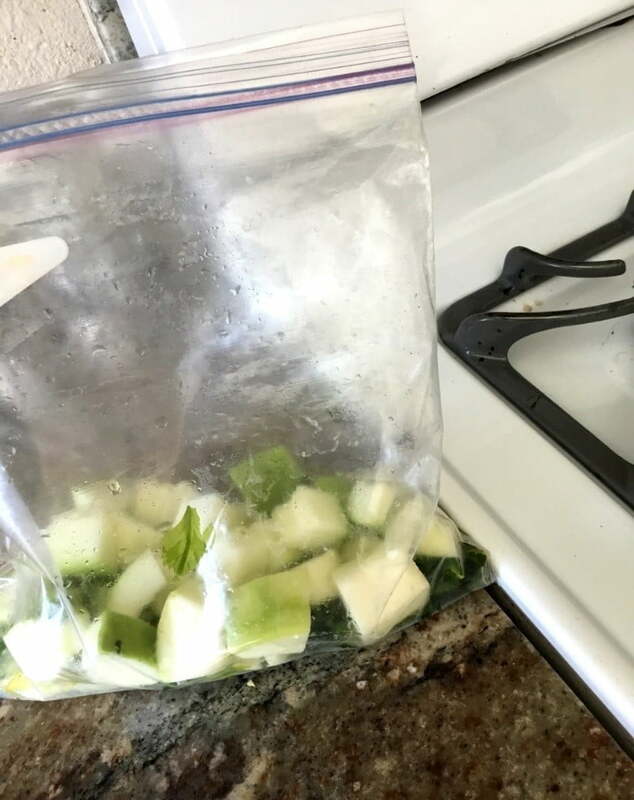 A gallon sized freezer ziplock bag packed full of frozen veggie scraps. A couple of medium carrots. A small to medium onion. About 3 stalks of celery. 3 to 5 cloves of garlic. 1 tablespoon of avocado, olive, or coconut oil. 8 cups of drinking water (I use spring or well water), or enough to cover veggies in the pot. A bay leaf, parsley sprigs, or herbs of your choice. Add oil with roughly chopped onion, garlic, carrots, and celery, along with celery leaves, to large cooking pot. Bring to medium heat and sauté till slightly softened, about 5 minutes. Add water, frozen veggie scraps, herbs, bay leaf, and season to taste. Bring to a boil, then lower heat to medium low. Simmer for about 50 minutes. Remove from heat. Strain broth through a large, fine messed strainer into a large heat proof bowl. Use the back of a wooden spoon to press down and eliminate all the liquid from the veggies. This can be a bit time consuming if you’re like me and have to squeeze out every drop. Discard. The solid scraps into you compost container to offer back to the earth from whence it came. Pour into freezer proof containers. Freeze till needed to make your next delicious, healthy meal. 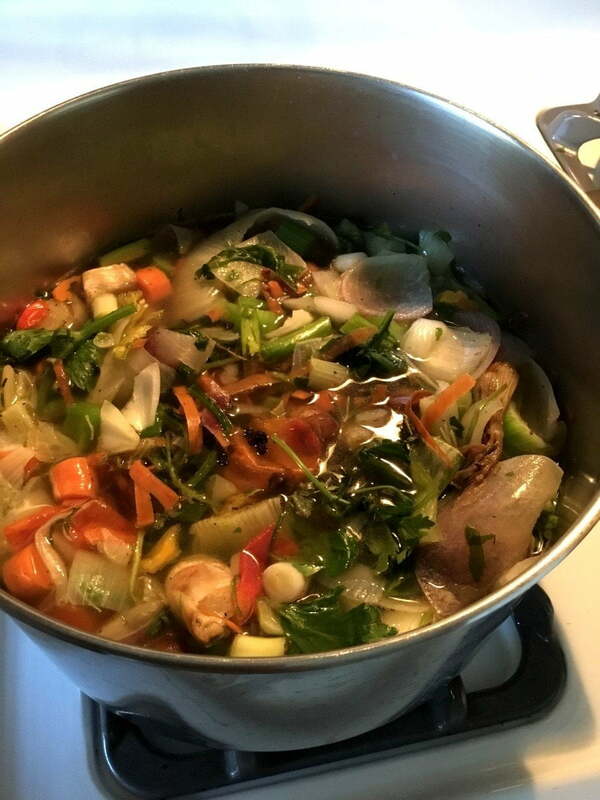 Please let me know how your homemade stock turns out in the comments section below. Or let me know if you have questions. I’d love to hear from you!